Unconventional wine and food pairings? Go for it ! I’ve often said this before, but it bears repeating: don’t be constrained by convention when it comes to matching wine with food. The more you experiment, the more you will realize – like I have – that it’s both fun and instructive to try just about any combination of food and wine that strikes your fancy. Wine snobs (aka Alt-Wine zealots) would have me dispatched to the grape crusher -if they could -for uttering such vinous heresy. You know the type of person I’m referring to, right? He’s the guy who wears a purple ascot and smoking jacket to the neighborhood barbecue, and wishes his name was Trevor. His mantra? White wine with fish and chicken, red wine with red meat- and absolutely no substitutes!! Hey Trevor, I have news for you: there are no hard and fast rules when it comes to choosing which wine to serve with a particular meal. Not that I would suggest pairing Chateauneuf Du Pape with pan seared cod, but go ahead and be adventurous. You might be surprised at the tasty combo’s you’ll discover on your gustatory journey. So here are some tips (not hard and fast rules) on where you may wish to start your wine and food pairing expedition. Think about the flavor, texture and weight of the food and then consider which wine might be a good fit. You wouldn’t logically pair a full-flavored red wine with delicately broiled seafood. Think about it. The flavor and weight are all out of balance. Instead, you might complement the dish with a delicate white wine such as Sancerre from the Loire Valley of France (made from sauvignon blanc) or an albarino from Spain. Conversely, a robust red wine such as cabernet sauvignon or merlot would pair seamlessly with a well-marbled rib-eye steak. Another element to consider in choosing a complimentary wine pairing is how the dish is seasoned. The addition of sauces or spices can add a flavor dimension that should be considered when picking the appropriate wine. For example, pinot grigio would be an excellent choice with poached salmon in a dill sauce, while grilled salmon that has been dusted with cumin, black pepper and chili powder would overpower that same wine. Here’s an example where I suggest choosing a red wine to marry with that particular dish. With no apologies to Trevor, spicy, grilled salmon requires a medium-bodied red such as pinot noir or even sangiovese. The texture of a dish can also play an important role in determining the best wine match. And sometimes that means pairing the dish with a wine that has contrasting notes or nuances. For instance, if you have a rich, fatty piece of beef, lamb or pork, a good wine match might be a young tannic and astringent red like zinfandel or petite sirah. That’s because the mouth feel of the wine will provide a pleasant contrast to the richness of the meat, and also serve to cleanse the palate. Probably the most difficult dish to pair with wine is any type of vinaigrette, particularly those used on salads. Vinegar or acid-based dressings clash with most wines, destroying the flavors of both the salad and the wine. The only possible palatable pairing I’ve found is to match the vinaigrette with a very dry sparkling wine such as a Cava from Spain. And finally, one of my favorite, but seemingly counter-intuitive pairings, is full-bodied red wine with chocolate desserts. As a matter of fact, one of the most exquisite dessert experiences I’ve had recently is paring the 2015 Orin Swift Abstract ($35) with a large slice of double chocolate cake. The Abstract (a California blend of grenache, petite sirah, and syrah) is an opaque, purple monster full of rich, mocha and blackberry flavors. It is an absolutely delicious complement to chocolate. And the Abstract bottle has a really one-of-a-kind label with a collage of eclectic images. It’s sure to be a collector’s item. So go forth and be adventuresome. Try some unconventional (maybe even outrageous) wine and food combinations. (Trevor will never know). I was asked the other evening to expound on the qualities of a particular grape grown in a number of different geographic wine regions around the world. How did it differ in taste and quality from one appellation to another? Good question, right? Things seemed to be going well as I began to describe the qualitative differences in terms of not only the taste and aroma of the wine, but also how climate and soil affected the finished product. So when I mentioned that this particular grape flourished in places like California, France and Australia, my friend asked: “How does the wine made from that same grape in Israel compare to the others? The grape we were discussing is syrah (which the Australians call shiraz) and I could tell from her disappointed look that my wine credibility had taken a serious hit. Could they really be growing syrah now in Israel? I asked my friend to spell the grape in question and she did so correctly without hesitation. However, she also added the word “petite” before spelling syrah. Ah, now I understood. The pronunciation of sirah (seer-ah) is the same as syrah, thus the misunderstanding. And, indeed, petite sirah is produced in Israel’s emerging wine regions. But, of course, petite sirah is a completely different grape than syrah. Holy obfuscation! There can’t be any other product that is more difficult to understand than wine. Maybe quantum mechanics, but I doubt it. To start with, much of the language – even on American wine labels – is foreign (i.e., “cabernet sauvignon, merlot, syrah, etc.). 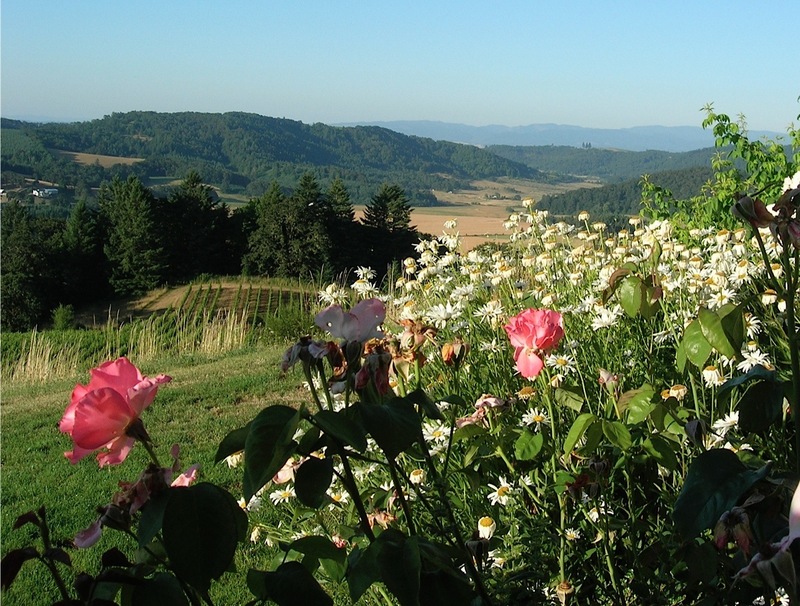 And when some of the so-called wine-illuminati use terms like ethereal, orgasmic or unctuous to describe “Uncle Amos’ Purple Mountain Majesty,” normal folks- who would like to learn a little more about wine – are left scratching their heads. And unless you’re studying to be a sommelier, you probably wouldn’t know that “Vino Nobile di Montepulciano” (which is from Tuscany and comprised of at least 70 percent sangiovese) is a totally different wine from “Montepulciano d’Abruzzo.” This latter wine is from the state of Abruzzo and is produced from the montepulciano grape. Confused? You should be. And while it can be maddening to someone who just wants to find a good bottle of wine to accompany their meatloaf and mashed potatoes, it can also be fascinating for wine geeks like me who enjoy nothing better than translating that bewildering gibberish for you. So here are four different and delicious examples of wines representing the confusing language discussed above. I think you’ll like them and I promise to use common words to describe them. 2010 Terre Rouge Cotes de l’Ouest Syrah ($22) – This California wine is full of bright cherry and spicy black pepper flavors. Unlike some new world full-throttle syrah’s, this one is medium -bodied and similar to a northern Rhone wine. This would be lovely with a spicy casserole of Chicken Cacciatore. 2014 Boogle Petite Sirah ($14) – There is nothing subtle about this inky purple monster, but it is still very well balanced with gobs of black and blueberry flavors and just enough acid to make it an excellent food wine. Try it with a hearty, garlicky beef stew dusted with a generous portion of coarsely ground black pepper. 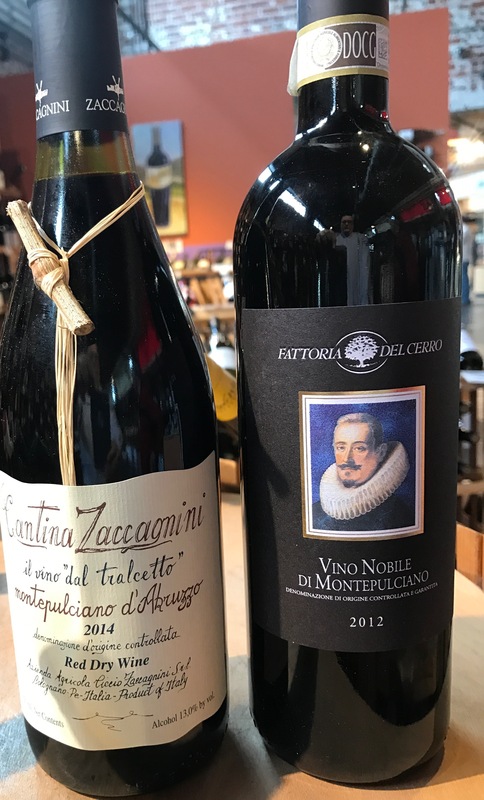 2012 Fattoria dell Cerro Vino Nobile di Montepulciano ($27) –You will need a glass of this delicious wine after trying to pronounce it! A nose of flowers, cola and mint is followed by notes of black cherries, vanilla and spice on the palate. Match this delicious wine with a crown roast of pork that’s been rubbed with olive oil, sage, black pepper and minced garlic. 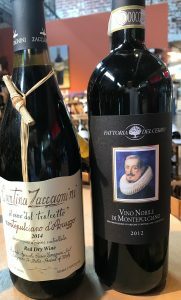 2014 Cantina Zaccagnini Montepulciano d’Abruzzo ($22) – Another tongue-twister, this wine bursts with sweet and sour cherry flavors along with nuances of cinnamon and tea. Round and rich, but with a good zing of acid, marry this baby with roasted or grilled lamb chops that have been marinated in lemon juice, Dijon mustard, garlic, olive oil and rosemary. Check out my Vines&Vittles video on Port by clicking below. There are not many good things one can say about winter except it is the season of Christmas and New Year’s Eve. But otherwise winter is gray, cold and depressing, and I wish it could be shortened. But until we figure a way to adjust the rotational tilt of the earth or flee to terra firma nearer the equator, we’ll just need to make some adjustments to survive this uncomfortable time of year. As you might have guessed, my adjustment to winter involves consuming endorphin-enhancing sustenance. In other words, good wine and food. And while I’ll be uncorking full-bodied red wines to accompany cold weather foods such as stews, pastas and hearty soups, I will also open a bottle or two of Port to enjoy as a postprandial digestif by the fireplace. And don’t worry if you don’t have a fireplace. Anywhere indoors will do just fine. Port or Porto (as it is called in Portugal where the wine is produced) is made from a variety of grapes grown along the steep slopes of Douro River. In fact there are more than 80 varieties of (unpronounceable) grapes which are permitted to be used in the production of port, but most producers use less than ten. Port is a “fortified” wine and that means brandy is added to it during the fermentation process. The addition of brandy causes the fermentation to stop, leaving the wine with about 10 percent residual sugar while bumping up the alcohol content to approximately 20 percent. Once the new wine is made, it is shipped to the city of Oporto where it is sold to companies, known as Shippers, who then age the young wine in barrels and label it under their house name before exporting it all around the world. Vintage Port -This is the best and most expensive type of Port and is produced only in exceptional years (about three years in a decade). A “vintage year” is declared by an agreement among the Shippers who then take special care in aging and then bottling the wine. Vintage Port can improve in bottle for 15 to 50 years (or more) before reaching maturity. The Wine Spectator Magazine rates the 1997, 2000, 2003, 2007 and 2011 as among the best recent vintage Port years. You can expect to pay between $50 to more than $150 a bottle for vintage Port. Late Bottled Vintage Port – It is a blend of Ports from different vineyards in the same vintage year. Late bottled vintage Port (or LBV) will have a vintage date on the label, but it is not vintage Port. LBV is usually priced between $15 and $30 a bottle. 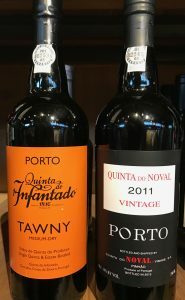 Tawny Port – This is sometimes called the “poor man’s” vintage Port because it is aged for many years in oak and, when released, it is very smooth and rich like an old vintage Port. Without a doubt, this is my favorite. It is affordable Port with prices ranging from $10 to about $40 a bottle. Ruby Port – Young port wine blends from several different vintages comprise Ruby Port. Ruby Port is lighter and fruitier than other styles and usually the least expensive Port ($10-$20 a bottle). Ruby Ports can be cloyingly sweet and fruity. Here is a list of some of top Port producers you can look for in your local wine shop. Warre’s, Graham’s, Taylor-Fladgate, Croft, Dow’s, Fonseca and Ramos-Pinto. One of my favorite American Port-style wines is Ficklin. Try their 10-year Old Tawny – it’s absolutely delicious. Many people prefer to accompany Port with nuts or with blue cheese like Stilton. I love to have a glass of Tawny after a nice meal as a liquid substitute for dessert. Yummy! So, go out and sip the winter away with a warming glass (or two) of Port! Check out my video wine picks for your holiday celebrating. Please click on the link below. And Happy Holidays ! It’s that special time of year when we all willingly succumb to something loosely defined as “The Holiday Spirit.” And while it is generally a good thing, the holiday spirit induces in me a kind of euphoria that causes me to recklessly disregard my own financial limitations. Yeah, you guessed it. In other words, I am about to spend a whole lot of money on wine – for family, for friends and for ME! And it’s not just yours truly either. Between Thanksgiving and New Year’s Day, Americans will spend about seventy percent of their yearly wine budget, purchasing bottles for Christmas gifts, parties, and for holiday dinners. To accommodate this demand, local wine shop shelves are now overflowing with bottles of every type and pedigree. I‘ve already been searching those shelves (and online too) for that special bottle and there is an incredible selection of wine from all over the world available to fit just about any budget. 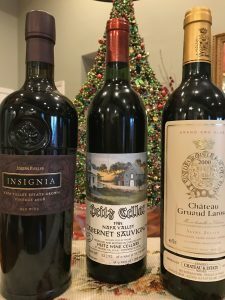 And I’ve always said that giving the gift of wine, particularly to someone close to you, can have its own reward since there is a good likelihood you’ll be invited to sip along with the giftee once that special bottle is uncorked. But whenever I consider a wine for myself, I always ponder what type of meal will present the best opportunity to showcase the bottle. In my particular situation, I’m thinking about Christmas Eve and Christmas Day meals, and the wines that will make the feasts memorable. I’m also shopping for the right wine to celebrate New Year’s Eve. So let’s consider wines to match Christmas Eve and Christmas Day dinners, as well as celebratory sparklers for New Year’s Eve. In our home, my wife and I divide up responsibility for the holiday meals. I’m in charge of Christmas Eve and she is the Christmas Day chef de cuisine. Drawing from my Italian- American roots, my menu will consist of seafood -ala The Feast of the Seven Fishes- and I will accompany the meal with some of my favorite chardonnays. For everything from squid and lobster to shrimp and smelts, I will use rich, full-bodied chardonnays. Here are some you might consider for a similar type feast: Falcor Henry Ranch or Sonoma Mountain, Mer Soleil, Cakebread, MacCrosite, Rombauer, Far Niente and/or Amapola Creek. Quilceda Creek Cabernet Sauvignon; Joseph Phelps Insignia; Dominus; Harlan Estate- The Maiden; Merryvale Profile; Chateau La Dominique; Groth Cabernet Sauvignon Reserve; Chateau Lynch Bages; Chateau Brainaire Ducru; Chateau Cos d’Estournel; Saddleback Cabernet Sauvignon; Pontet Canet; Leoville Las Cases; Heitz Martha’s Vineyard Cabernet Sauvignon; and Ornellaia (from Italy). To ring in the New Year, I always pop open a sparkler. Try one or more of these bubblies: Roderer Estate (sparkling) Paul Bara Brut Champagne; Nicholas Feuillatte “Blue Label” Brut Champagne; Mumm Napa Cuvee (sparkling); Veuve Cliquot Brut Champagne; Iron Horse Russian Cuvee (sparkling) Krug Grande Cuvee Brut Champagne; Perrier Jouet Grand Brut Champagne; Taittinger Comptes De Champagne Rose. Have a great Christmas, Hanukkah and New Year’s Eve, but watch out for that “runaway” Holiday Spirit! From time to time, I’ll be posting video featuring Vines & Vittles topics. Check out the link below for information on Beaujolais Nouveau and for some wine suggestions for Thanksgiving. Hope you like it! When most of us think of November in the context of food and drink, Thanksgiving comes immediately to mind. But there is another date – also a Thursday and always one week before Thanksgiving -that should have particular significance for wine lovers. On November 17, the 2016 Beaujolais Nouveau will be released in France and available in the US- even here West Virginia. Beaujolais Nouveau is a fun sipper full of fresh strawberry and cherry flavors that is the first wine of the 2016 vintage. The Nouveau, produced from the gamay grape, is only two months old when it arrives in wine shops and cafes around the world. You can expect Beaujolais Nouveau to be a lively, frothy, fruit- forward mouthful of wine. At its best, the wine is a pleasant quaffer that is never meant to be taken too seriously, but rather should be enjoyed in celebration of the new vintage. It would also be a good wine to use as an aperitif before your Thanksgiving dinner. But there are more serious wines made from the gamay grape in Beaujolais and today I’ll tell you about them. The Beaujolais region lies just south of Burgundy and descends along a 34-mile stretch of rolling hills ending where the Rhone wine appellation begins. Gamay is a lighter pigmented red grape that regularly produces a medium bodied wine similar in texture to pinot noir. In addition to Nouveau, most of the other wines in the appellation are labeled Beaujolais, Beaujolais Superior or Beaujolais Villages. These wines are all more substantial in texture and flavor than Beaujolais Nouveau. 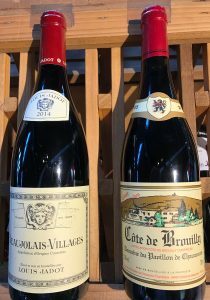 The very best wines of the region, though, are called Cru Beaujolais and they are much more serious and can actually improve in the bottle for many years. These Cru (which means “growths” in French) wines are named after the villages around which the grapes are grown. The ten Cru Beaujolais wines are: Brouilly, Chenas, Chiroubles, Cote de Brouilly, Fleurie, Julienas, Morgon, Moulin-a-Vent, Regnie and Saint Amour. Each of these Crus produces distinctly different Beaujolais from very light and delicate (i.e., Chiroubles and Fleurie) to fuller-bodied wines (i.e., Moulin a Vent and Morgon). 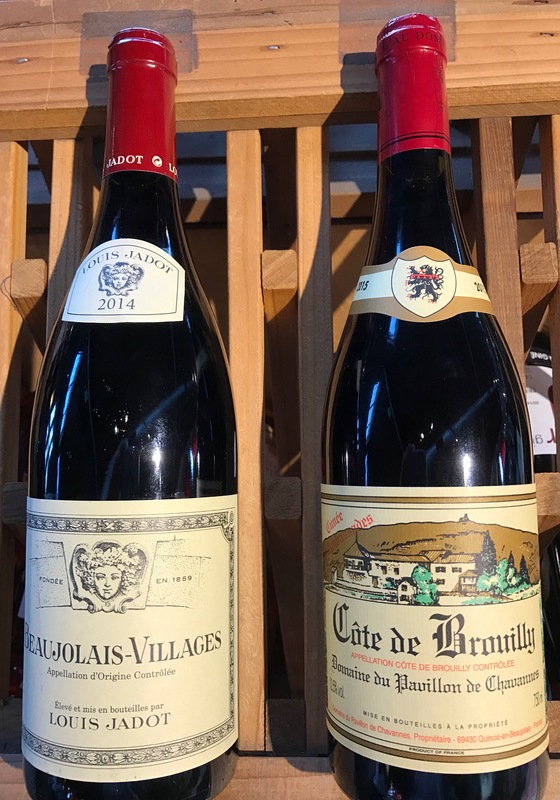 Like Burgundy, it is very important to select your Beaujolais from reputable producers and shippers. Among the most reputable of these are: Joseph Drouhin, Georges Duboeuf, Louis Jadot, Louis Latour and Domaine Manoir du Carra. And unlike Burgundy, these are wines that are reasonably priced – usually between $15 to $30 a bottle. In matching these wines to food, I suggest you use the Crus Beaujolais like you would a medium-bodied pinot noir. These Crus show the best qualities of the gamay grape, producing in good years silky smooth wines with cherry and tea flavors and aromas of crushed flowers. I particularly like to pair them with roast pork tenderloin, grilled salmon or Thanksgiving turkey. So celebrate the first wine of the 2016 vintage by sipping a glass or two of Beaujolais Nouveau. Try it with cheese or as an aperitif and then open a bottle of Beaujolais Villages or Cru Beaujolais to accompany the dinner entree. Hey, friends of wine, I’m back! After that last column where I focused too much attention on that other beverage, I was whisked away in the middle of the night and brought to a wine reeducation center for an intervention by a group of masked wino’s called “Warriors For The Vine. As a result, I want you to know that I’m back and more dedicated than ever to expounding on the virtues of that liquid we all love. As a matter of fact, I have had my nose in a plethora of wine glasses lately, spending hours sniffing and sipping my way through dozens of bottles just to present you with several vinous recommendations. And with the exception of one wine (out of the 10 I’m recommending today), they are all priced between $9 and $20 a bottle. If you don’t see these wines on the shelves of your favorite shop, just ask the proprietors to get them for you since they are all available in the state. As is always the case when I suggest a wine for your sipping pleasure, I will also offer an appropriate food to pair with it. So here goes. 2014 Montinore Gewürztraminer – a spicy, slightly sweet white with aromas of flowers and nutmeg, this would be great with sliced apples and Vermont Cheddar; 2015 Fritz de Katz Riesling – this German Mosel white is tangy, a touch sweet with peach overtones and would be nice with strawberries or brunch food like omelets; and 2013 Pacific Rim Eufloria White – this is mostly riesling blended with a little gewürztraminer and chenin blanc and has citrusy, tart apple flavors that would be a superb accompaniment to Quiche Lorraine. 2014 Ceretto Arneis – Light to medium-bodied and slightly fizzy, this northern Italian bottling is delicate and should be paired with plainly broiled or pan seared white fish; 2014 Clos Pegase Chardonnay ($25) – this Napa Valley wine is very well balanced with a nose of ripe apples and freshly baked bread with flavors of ripe honey dew melon. Pair it with chicken cordon bleu; and 2014 Buil & Gine Nosis Verdejo – a Spanish wine full of citrus and apple flavors that is slightly effervescent. It would be an excellent pairing with steamed mussels in a little of the verdejo and a lot of garlic. 2012 Haraszathy Family Cellars Old Vine Zinfandel – a medium to full-bodied old vine zin from Lodi, this wine is chock full of blackberry and cola flavors, and demands to be paired with grilled baby-back ribs; 2015 St. Cosme Cotes Du Rhone – from the magnificent 2015 vintage, this wine must be aerated in a carafe for an hour or so if you choose to drink it in the next year. It is dark purple and very tannic with flavors of black cherries and aromas of black pepper and tack room. Try this one with marinated and grilled flank steak that has been stuffed with mushrooms, spinach, sausage and provolone.